by discovering issues before you buy. Peace of Mind Sleep well at night in your new property knowing that you made the right decision by having it inspected. I will provide you everything that you need to make and informed decision about your home purchase. We will review every aspect of the property from foundation to roof and everything in between. Click here to view an example of the extensive report you will receive after your home inspection. Our pricing structure is based on square footage see our extensive pricing chart for single family homes and condiminiums. We provide on time, efficient reports of your property. 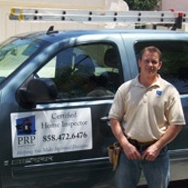 At Professional Residential Property (PRP) Inspections, we believe in "old fashioned" customer service. Your inspector will be prompt, courteous, and informative. We stand by our slogan, "Helping you make Informed Decisions", and extend our services beyond the inspection process. If you have any questions, no matter how long after the inspection, we encourage you to call. We are always here to help. "Michael was ready to get the inspection started before we even got to the property. He was friendly, personable, and engaging. He definitely went above and beyond what was required of him and explained everything in an easy to comprehend manner. I therefore highly recommend the services of PRP Inspections and, most pointedly, Michael. "